The most exciting news of the past few days to me came in the form of the announcement of a movie adaption of Okazaki Kyōko’s iconic manga River’s Edge. Principal photography is already being done while the movie is scheduler for a 2018 release in Japanese theaters. Okazaki started her work as a professional mangaka in the early 1980s, releasing mostly short stories and one-volume series both in manga magazine but also sub-culture and fashion magazines. Her extremely productive career – which earned her a cult following among readers and critics alike – was brought to a sudden tragic halt when she was hit by an SUV in 1996. To this day, she hasn’t been physically able to publish a new manga. She is thoroughly missed by her fans and throughout the years has influenced and inspired a lot of creative and intellectual people, among them artists, musicians, film directors, as well as cultural critics and scholars. River’s Edge (published from 1993 until 1994 in the fashion magazine CUTiE and as a tankōbon in 1994 by Takarajimasha) tells the story of Haruna, a girl in senior high school who recently broke up with her bully and drugdealer boyfriend, and Yamada Ichirō, who is secretly gay and one of the victims of Haruna’s ex-boyfriend’s cruelties. Yamada one day tells Haruna her about his strange ‘treasure’ – a dead body he found by the edge of the river… River’s Edge is undoubtedly among Okazaki Kyōko’s most accomplished works. 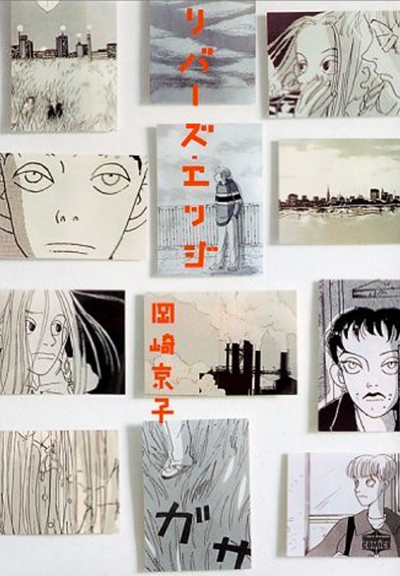 It is carried by Okazaki’s characteristic way of portraying young people in the 1980s and, in this case, the 1990s, their boredom, loneliness and lack of direction, partly due to their parents’ affluence, their fears and ambitions, their obsession with appearance – but Okazaki goes deep below the surface and finds the ugliness people try to hide and, at the same time, the very moving and fleeting beauty of what it means to be human. The movie adaptation is currently in its filming stage, with director Yukisada Isao collaborating with Setoyama Misaki on the script. Yukisada rose to fame in 2001 with GO, a romantic zainichi action drama based on the same-titled novel written by Kaneshiro Kazuki. I’m very interested in seeing how he translates Okazaki’s very distinctive visual style into moving pictures. Haruna, the heroine, will be played by Nikadō Fumi and Yamada by Yoshizawa Ryō. (Coincidently, the two have previously acted together in the 2016 movie adaptation of Hatta Ayuko’s manga Ōkamishoujo to Kuroōji (Wolf Girl and Black Prince, serialized in Betsuma/Shueisha).) This will be the second movie adaptation of a manga by Okazaki Kyōko, following Helter Skelter for which Okazaki received the Tezuka Osamu Cultural Prize and which she worked on until the accident in 1996. The movie starring Sawajiri Erika was directed by photographer Ninagawa Mika and released in 2012. Categories: Film/TV, Manga, Manga News. Tags: decade: 1990s, director: yukisada isao, keyword: movie adaptation, magazine: cutie, manga news, mangaka: okazaki kyoko, movie news, publisher: takarajimasha, type: crossover manga, type: josei manga, type: shoujo manga. 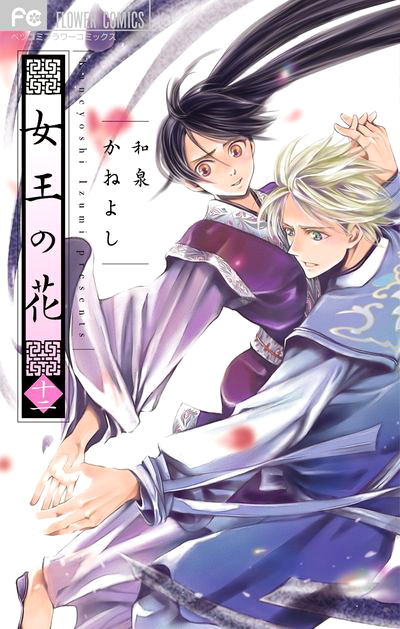 Posted on Mar 27, 2017 (Mon, 1:08 am). .
Izumi Kaneyoshi’s long-running historical manga Joō no hana (The Flower of the Queen) officially came to end with its last installment published at the end of last year, in the 1/2017 issue of Shogakukan’s Betsucomi. The final comic volume, the 15th of the series, will come out in about three weeks on March 24. Besides the regular edition of the tankōbon (463 yen), Shogakukan has announced a special limited edition for 850 yen that comes with a memorial fan book containing lots of illustrations, character analyses and famous phrases, and the alternative ending of the manga published as a furoku in Betsucomi 2/2017. It’s already up for preorder at most online book sellers. This sounds like an absolute must-have for any Joō no hana fan, even the casual one! Joō no hana started back in 2008 in Betsucomi. 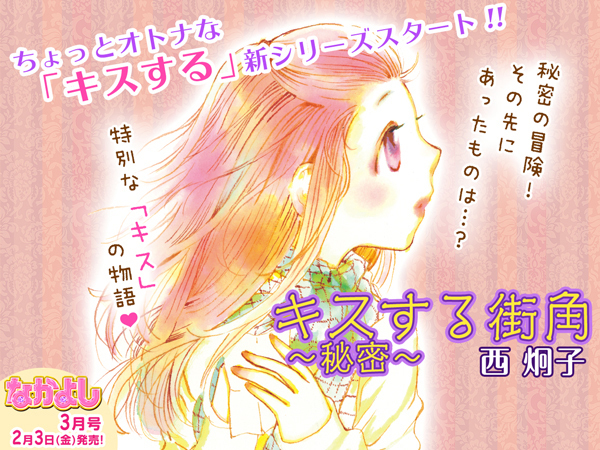 It received the 60th Shogakukan Manga Prize in the shōjo category. A French translation (titled La Fleur millénaire) is being published by Kazé Manga, while Ever Glory Publishing has licensed it for publication in Taiwan. Along with Hakusei and the mysterious merchant Seitetsu who supports them, 14-year old Aki has a long journey ahead of herself during which she’ll have to prove that despite being a young woman, she has the tactical abilities, the talent and the strength to rule over the country of A. Through the years she’ll experience loss and betrayal from people she trusted. 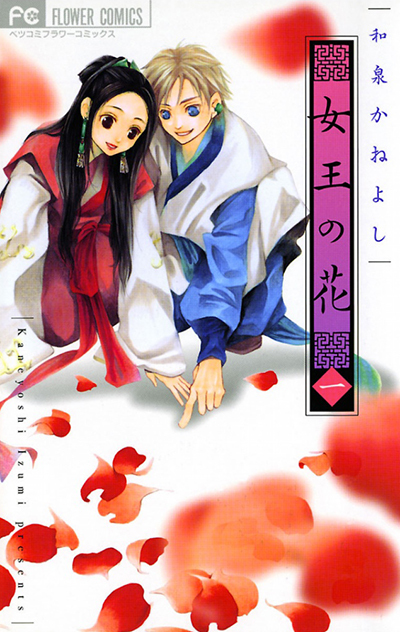 Her development from a girl seeking revenge for her mother’s death to someone worthy being called a queen has captured many readers over the years, not just thanks to its gripping story but also because of the romance between her and Hakusei, of course ;) This is a shōjo manga after all, a pseudo-historical one, yes, but rest assured this doesn’t drown you with dry facts and terms. It does explain some strategic elements during the conflicts and wars between A, Kō, Do and Sō but it’s all easy to follow and helps keep up the tension of the story. 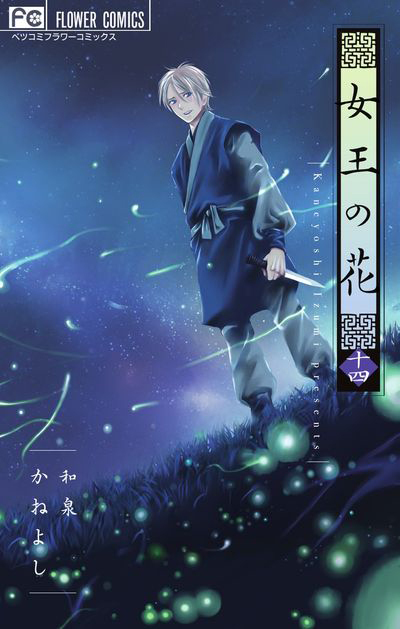 The final comic will be the 15th volume of the series which means it’s been a long journey for both Aki, Hakusei and the reader, but I haven’t experienced a single boring moment during my time reading it, so I have the highest of hopes for the ending! Tags: decade: 2000s, decade: 2010s, genre: historical, genre: romance, keyword: china, magazine: betsucomi, mangaka: izumi kaneyoshi, publisher: shogakukan, type: shoujo manga. Posted on Mar 3, 2017 (Fri, 7:03 pm). . 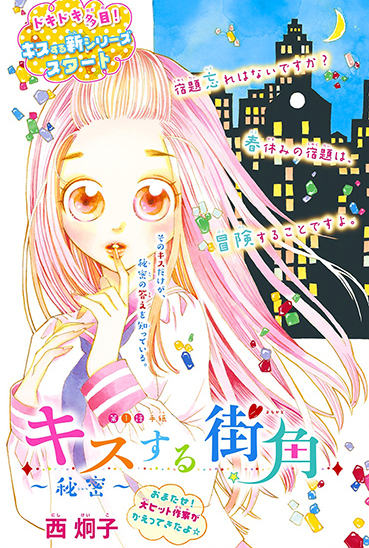 The ever-busy Nishi Keiko has a new series out and it’s called Kisu suru machikado ~Himitsu~ (The Streetcorner Where They Kiss ~Secret~). The first chapter of it is featured in the March issue (3/2017) of Nakayoshi (Kodansha). This means Nishi-sensei’s back to writing something primarily targeted at a younger audience again – just like her hit series Koi to gunkan (Love & Battleships) which also ran in Nayakoshi and managed to capture a very wide readership age-wise, both female and male. The preview image and sample pages have a certain calm retro charm to them, with the most prominent visual feature being the exaggerated huge round eyes of the main character, a young middle-school girl called Koharu. And yes, I’m very much aware of the irony of stating the obvious for shōjo manga but – to readers familiar with Koi to gunkan and its heroine Kana, the character design is pretty similar here – the forehead and eyes of the younger characters, especially the heroine’s, are pretty large even by comparison with other titles running in Nakayoshi. The story starts with Koharu having to stay at home instead of going on vacation with her family for the spring break because she wants to take care of her sick grandmother. Koharu happens to find two old letters addressed to her grandmother which were both sent from abroad… The series promises both the usual romance (with kissing/kisusuru the serie’s proclaimed theme) and dokidoki with secret adventures so chances are high this is going to be as much of an exciting rollercoaster ride as Koi to gunkan. I think the grandmother’s past may play a huge part in the plot and one can already sense quite a bit of heartbreak just from the teaser pages. From a more formal point of view, Nakayoshi is calling this a shiriizu (シリーズ) instead of the usual rensai (連載) for longer works, so if I’m interpreting this correctly the story around Koharu might not become as epic as the 8-volume Koi to gunkan and the cast of main characters might change sooner than later. 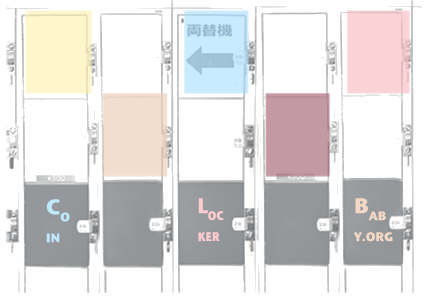 Either way, I’m not expecting the first tankōbon to be released before the end of the summer. It’s going to be a long long fight with my impatience until then as I can’t wait to read what adventures Nishi Keiko has prepared for her characters this time! Tags: decade: 2010s, genre: adventure, genre: romance, magazine: nakayoshi, mangaka: nishi keiko, publisher: kodansha, title: kiss suru machikado, title: koi to gunkan, type: shoujo manga. Posted on Feb 18, 2017 (Sat, 5:12 pm). .